What's new inMaps 3D 5.0? iPhone and the App Store are trademarks of Apple, Inc.
Google Earth is a trademark of Google, Inc.
Maps 3D now really turns your iPhone into a fully fletched GPS. With our routing engine you are truly independent without the need of a data connection. After two years of development, we can now present you our new offline routing for any outdoor activity. No matter where you are (ok, for now this planet only) - feel safe and assured, that we find a way for you. You can choose from different profiles for hiking, bike, MTB, race bike or street. Based on multiple user requests, instead of 10.000 tiles you can now load single maps of up to 50.000 tiles each. When using the 'Detail' scale, this covers an area of 1600 square kilometers. This function is also offered as an In-App purchase, as with the big amount of map data huge license and server costs have to be covered. In the same package, we offer a new map scale 'City'. 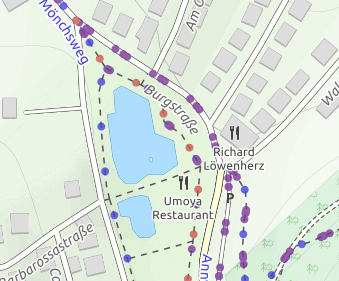 This allows you to load maps with an even smaller scale (OSM 17), so you see more details, POIs and names. Identify your position better than ever before. Enter coordinates more easily now in all common formats: WGS84 (Longitude and Latitude), UTM and MGRS. We hope you like the new features. Please support us, so we can keep on improving and developing new functions for Maps 3D.